Why a hub? 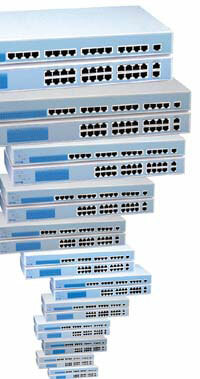 Network switches are faster, more efficient and destined to dominate network infrastructures. But for right now, network managers who need to find the shortest, least expensive route to upgrading their systems have plenty of good reasons to include stackable hubs in their plans. Network hubs, often called repeaters, are among the traditional building blocks of networks. They work by sharing available bandwidth among all connected devices on the network. Dual-speed 10/100-Mbps hubs can provide shared 10-Mbps Ethernet or 100-Mbps Fast Ethernet bandwidth to all users on a network. Stackable hubs are freestanding or 19-inch rackmount units connected in a vertical stack by special cables and port connections. A stack of hubs appears to the network to be a single logical domain, and it multiplies the number of available ports in a single hub by the number of hubs in the stack. So a stack of six 16-port 10/100-Mbps dual-speed hubs can provide up to 96 10-Mbps or 100-Mbps port connections. If the same stack is cascaded to a similar hub stack, the number of ports can double. Many of the stackable hubs listed in the accompanying table also come with built-in or modular management, capable of bridging and routing, and even switching modules, to provide more intelligence and a fairly wide range of network control. Why not use a switch alongside or in place of a hub? In many cases you should, and in fact most of today's advanced networks include both. Network switches provide dedicated, switched connections to attached network devices at full-bandwidth speeds. Thus, a dual-speed Ethernet switch can provide dedicated 10-Mbps Ethernet or 100-Mbps Fast Ethernet connections, or both, to any user on the network. All switches contain tables of Medium Access Control addresses for each network device and can make direct connections by remembering which port each one is connected to. But in cases where direct high-speed connections aren't called for, a stackable hub array is more cost-effective than a switch. And because stackable hubs can easily scale upward to dozens, even hundreds of ports, they can effectively serve most workgroups or small departments. High-speed asynchronous transfer mode, Fiber Data Distributed Interface and Gigabit Ethernet technologies are coming on strong, especially at the backbone and WAN levels, but Ethernet still reigns supreme on LANs. Most large organizations still run dozens of 10-Mbps Ethernet LANs, and moving up to 100-Mbps Fast Ethernet can be the least painful way to gain more bandwidth without disrupting an entire system. Fast Ethernet uses the same Carrier Sense Multiple Access Collision Detection protocol as Ethernet, with the same basic error-control functions, frame formats and frame lengths. And because Fast Ethernet doesn't meddle with the upper-layer protocols used by Ethernet, network upgrades don't generally require changes in Simple Network Management Protocol management information bases or the software used by networked PCs and servers. Best of all, moving to Fast Ethernet lets you keep legacy 10Base-T equipment, such as network interface cards, hubs and switches, so huge retrofits to the network infrastructure aren't required and training is kept to a minimum. Organizations not yet ready to make a wholesale switch to Fast Ethernet can build a combined Ethernet-Fast Ethernet network using dual-speed switches, hubs, routers and NICs that operate at both 10-Mbps Ethernet and 100-Mbps Fast Ethernet speeds. These items are inexpensive and provide a perfect bridge technology until you decide which high-speed networking route you want to take. 10/100 autosensing. The hub ports automatically adjust their speeds to operate with attached equipment. When the link is established, the hub automatically communicates with the other device at its top speed, whether 10 Mbps or 100 Mbps. Internal switch or bridge. Dual-speed hubs have two independent built-in segments, one 10-Mbps Ethernet and one 100-Mbps Fast Ethernet. An internal switch bridges the two segments so the devices can communicate while running at either speed. Full- or half-duplex. Full-duplex operation effectively doubles the speed of each network connection'from 10-Mbps to 20-Mbps, or from 100-Mbps to 200-Mbps. MDI or MDI-X. The Medium Dependent Interface switchable port permits simple cascading of hubs, switches or downlinks without a special crossover cable. The MDI and MDI-X ports are used together on the different hubs to be connected. MII. The Media Independent Interface can be used in place of the three Fast Ethernet media specifications: 100Base-TX, 100Base-FX and 100Base-T4. Mix-and-match. Users can stack hubs of many sizes'mixing 12-, 16, and 24-port configurations'as long as they are from a single manufacturer's product line. A few manufacturers require that at least one of the hubs in a stack be a managed hub. Others sell various slave or client models for use with a single master unit within the stack. Management. Some stackable hubs come with standard management packages. Others come with optional management modules that include SNMP support for four Remote Network Monitoring protocol groups'events, alarms, history and statistics'and browser-based Web management features. Optional modules. Many stackable hubs are modular and customizable, allowing users to add extra 100-BaseFX fiber Fast Ethernet WAN links or management modules. Diagnostic LEDs. These typically indicate such things as network traffic, port status, speed, full- or half-duplex operation, fault checking, power on-off status, packet receipts and collisions.